Staff in the O&G Department decided to take matters into their own hands and challenged their colleagues to never use a disposable cup again. 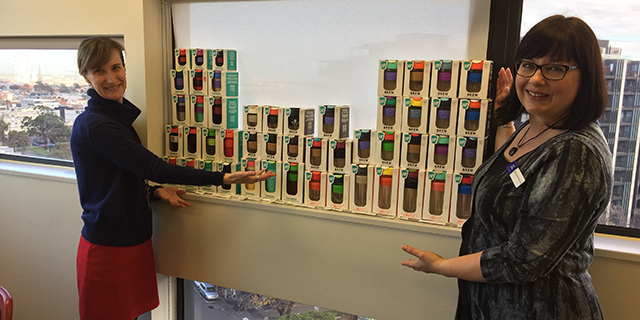 Michelle Kelsey (left) and Meredith Poyner from O&G Department presenting a huge 51 KeepCups to the new habitual coffee cup reusers. Photo supplied. After the ABC’s popular 'War on Waste' series reported that 1 billion disposable cups go to landfill every year in Australia alone, staff in the Obstetrics and Gynaecology Department (based at The Women’s) decided to take matters into their own hands and challenged their colleagues to never use a disposable cup again. The precinct created a fun war on waste campaign over three weeks in June, and it was a roaring success, with 51 KeepCups ordered and delivered to staff! According to KeepCup, half of the plastic produced globally goes into products that are used only once, which creates a staggering amount of waste. "Inconvenience is no longer an acceptable reason. Reuse or refrain", they state on their website. And the research team agrees. Congratulations to everyone involved - a massive effort and commitment to change their habit from a "disposable drinker" to a "habitual reuser!" If your team would like to take on this challenge, feel free to get some tips on how to convert your colleagues from Michelle Kelsey or Meredith Poyner.